Per capita income of the 16 villages located in Kozak was $14,000 before global warming caused a severe reduction in the local pine nut production. The people living in the highland villages of Kozak, located in the Aegean province of İzmir, enjoyed the highest per capita income in Turkey until eight years ago, when climate change hit their pine nut production. Nowadays, the villagers either make a meager living by working as stone quarries or mines. The villages are situated among dense pine forests, known by locals as the "green sea" and used to produce up to 2,000 tons of pine nuts, about 10 percent of global production. The wholesale price of pine nuts by the kilogram was TL 90 ($28.36), with supermarkets selling the specialized nut for TL 140 per kilogram. As a result of approximately $1-million income from the nuts, the villagers' per capita income was around $14,000, much higher than the rest of the country. However, things started to change in 2008, said Aşağıcuma neighborhood's village head Mehmet Çamgül. "Unfortunately, that wealth is a thing of the past. In 2008, the production suddenly halved. Then, the trees stopped producing the nuts, with sales close to zero until 2015. Our entire lives were indexed to pine nuts and when that collapsed, people started to migrate to nearby towns. From my own village alone 35 families have gone. They now work at factories there. Those who decided to stay work at stone quarries or mines. Some work at animal husbandry and adapt to the changed circumstances. " Many experts had investigated the reasons why the dramatic drop in pine nut production, Çamgül said, adding, "At first everyone focused on bugs or fungus. At the end, the İzmir Forestry Department concluded that the cause was climate change." "We can foresee future production trends by looking at the trees. We now know nothing will change until 2019. Many have given up hope that pine nut production will return to its past highs, cutting down trees to make way for farming." Tuncay Can from the İzmir Forestry Department said 18 separate studies were analyzed with the Aegean University and the Aegean Forestry Research Institute. "Similar drops in pine nut production are seen in other Mediterranean countries like Spain, France and Italy. Temperatures around the Mediterranean Sea have risen by 1 degree Celsius, affecting rains and winds. Springs, when fertilization occurs, are rainy and summers are hotter, directly affecting the trees. Another cause is a pest called 'leptoglossus occidentalis.' We are beginning a campaign against the pest but we can't do much about climate change." 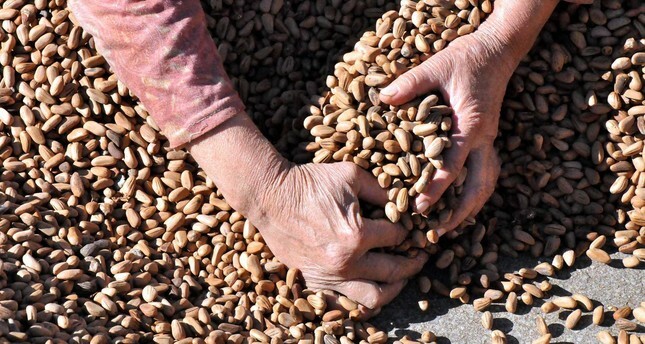 Bergama Chamber of Trade Chairman Fikret Ürper said nut production had dropped from 2,000 tons to 300 to 500 tons, with producers from China and India taking over the markets that used to be dominated by Turkish produce.